It gives them more energy and leads to faster recoveries. Last month, Men’s Fitness profiled seven top-ranking vegan athletes. A couple weeks earlier, the Boston Globe wrote a long piece about how New England Patriots star quarterback Tom Brady is causing players throughout the National Football League to eat vegan. And all summer UK soccer club Forest Green Rovers created headlines because the team eats vegan to boost performance and plays in a stadium that serves only vegan food. But this trend of athletes eating vegan isn’t just for the elite few. A small but growing number of Maine athletes are turning to plant-based foods to up their competitive edge. And sometimes this edge can surprise others. Lisa Fasulo of Portland is 5 feet 4 inches tall, weights 136 pounds, eats a totally raw vegan diet and won first place in a powering lifting meet in August. Fasulo is a fitness trainer at Quest in Portland and Turning Point in Scarborough and runs the personal fitness and nutrition coaching business Get Fit2. She has been power lifting for two years and eating vegan for six. Fasulo initially turned to plant-based foods to treat her celiac disease and then found it benefits her workouts, too. On days she’s weight lifting and teaching a spin class, she needs to eat up to 5,000 calories. To meet this caloric demand on a diet of low-calorie, fiber-rich fruits and vegetables, Fasulo spends time every night prepping raw food. She packs a cooler with meals composed of cut vegetables, fruits and her raw “tofu,” which she makes herself from cashews and coconut. 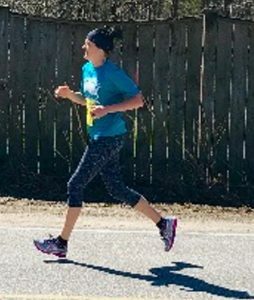 Vegan runner Kristin Burgess competes in the Kennebunk 5 Miler. Long distance runner Kristin Burgess, of Westbrook, had a similar experience after she switched from a vegetarian to a vegan diet. Burgess was a vegetarian when she took up long distance running, which soon led her to learn about ultra endurance athlete Rich Roll. Roll is an author and the host of a popular fitness podcast. He is also a vegan. Burgess has since found that combining a vegan diet with plenty of water and stretching helps her body recover more quickly from a run. 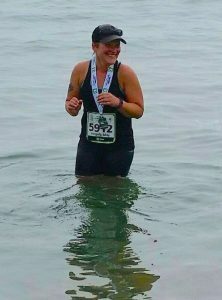 Angela May Bell, who is a vegan, cools off in the ocean after running the 2017 Beach to Beacon race this year. Long distance runner Angela May Bell of Portland is banking on these same anti-inflammatory qualities to help her overcome the first injury she’s sustained in more than a dozen years of running and eating vegan. In late summer, she developed a cyst in her left foot, which began after she walked around New York City in flip flops. At first she ignored the pain and kept training for the Mount Desert Island Marathon, which takes place Oct. 15. But the pain worsened and a few trips to the doctor later, she had her diagnosis. She’s won’t be able to run the marathon this year, but her plant-based diet gives her a positive outlook. To speed recovery, Bell is eating more leafy greens and adding more turmeric to her meals. In recent years, Bell has used her running as a way to raise money for Sea Shepherd Conservation Society, whose ships roam the high seas and work to disrupt illegal whaling ships. Like Bell, Hunter de Garmo is a vegan who uses his sport to raise money for and awareness of a cause he cares about. The ultra endurance athlete founded the annual STRIDE Walk. Jog. Run. event that takes place each May at the Boothbay Region YMCA in support of the Maine Parkinson Society. Vegan ultramarathoner Hunter de Garmo in the STRIDE Walk. Jog. Run. fundraising event in May. A resident of Wiscasset, de Garmo started running seven years ago around the same time his mother was diagnosed with Parkinson’s disease and he went into recovery from drug and alcohol addiction. After he entered recovery, de Garmo stopped eating meat and soon cut out dairy and eggs. In order to run an ultramarathon – which is any race longer than a marathon – de Garmo said he has to be prepared with nutrient-dense meals and snacks made from whole, plant-based foods. 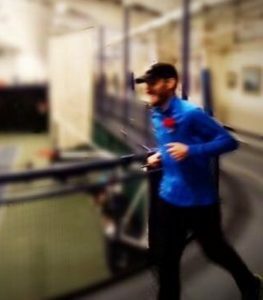 Favorite foods he consumes while running the track at the YMCA include smoothies and energy balls he makes from dates, nuts and seeds. While power lifter Fasulo has encountered skeptical comments about her vegan diet from others in her sport, de Garmo has seen the opposite. Their interest spurred de Garmo to create a vegan recipe booklet for this year’s STRIDE fundraiser and to serve butternut squash alfredo and black bean brownies to participants. And while the food is well received, it’s his results that most intrigue his fellow runners. He said his switch to a plant-based diet totally changed how his body responds after a run. “I can run 24 miles one day and 26 the next and not even be sore,” de Garmo said. After this year’s STRIDE fundraiser, where he ran 31 miles in six hours, he left, hopped in his car and went to pick up a stroller for his son. De Garmo’s vegan diet has meant a new normal.